The fact that the a single iPhone 4S works on Sprint, Verizon and AT&T would seem to open up so many possibilities for users that want to transfer service providers at the end of their contract or even switch back and forth when they travel. However, because of both business reasons and technical limitations, that flexibility isn’t what one might think. In order to work on a CDMA network, an iPhone 4S has to be activated on a CDMA network at time of purchase (and switching a device even between Sprint and Verizon is harder than one would think). That limitation also means that, although Apple is selling an unlocked iPhone 4S, it is really only an unlocked GSM version, the kind used by AT&T. And, like prior unlocked iPhones, while they can work on T-Mobile USA, they will run only at 2G speeds because T-Mobile’s fastest networks use a band that is different than that of AT&T and not one supported by the iPhone. These issues also crop up when using the iPhone as a “world phone.” While an iPhone 4S activated on Sprint and Verizon can roam onto GSM networks, such as those used in Europe and parts of Asia, an iPhone activated on AT&T won’t necessarily be able to run on CDMA networks outside of the U.S., such as those in Korea. There can also be business rules imposed on how easily the iPhone (or any phone) can be made to run on other carrier’s networks. Some of those policies can continue even after a contract has ended, as Apple notes in the fine print of its technical specifications for the new iPhone. “The iPhone model you purchase is subject to your wireless service provider’s policies, which may include restrictions on switching service providers and roaming, even after conclusion of any required minimum service contract,” Apple states. 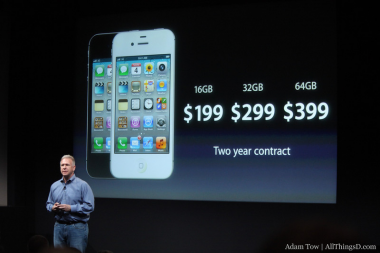 While arcane and perhaps irrelevant for those that don’t travel much and plan to stick with one carrier, such considerations are worth pointing out, especially as the iPhone 4S goes on sale at midnight.